Of course I am always sad to see a post like this for a senior animal on Petfinder. I hope I can help find a new situation; I suggested Home for Life. 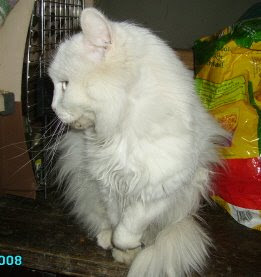 Sno Ball is a senior cat who is in a rescue that is closing. She was born blind and needs a special home. She is accustomed to cats and dogs. She does have a difficult time staying oriented when picked up. Needs a warm spot in a home where it will not matter if she misses the litter pan, as this does happen. Perhaps a more restricted area would be helpful. A beauty of a girl, she will also benefit from gentle brushing to keep her gorgeous white coat free from matting. A little metamucil on her food will help with furballs as well.